The Glacier Bay Top Mount Stainless Steel ALL-IN-ONE 20.6inch x 31.3inch x 8 inch deep double Bowl Kitchen Sink is with a contemporary design. 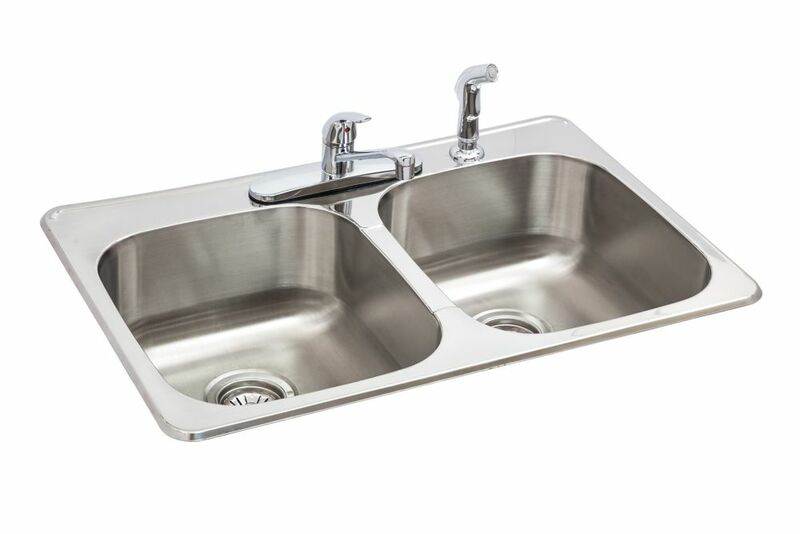 20-gauge premium 304 series stainless steel, the multi-layer undercoating significantly reduces noise when the sink is in use and prevents condensation. The stainless steel design complements many decor styles and the top mount installation allows for simple integration into your kitchen design. Easy to install with mounting hardware included. Limited Lifetime Warranty. A perfect fit for tight spaces. Deep bowls and tight radius corners provide generous space for large pots in a compact sink size. Rear positioned drain holes keep plumbing to the back of the cabinet so that storage space is maximized. Made in Germany to Blanco's exacting standards of quality and design, this sink offers unmatched quality and value. With its unique, curved basin shape and deep double bowls, Octave has a sleek, convenient design that easily accommodates larger pots and pans. An engineered sound-absorption system significantly reduces disposal and dishwashing noise for a quieter kitchen environment. Octave is crafted from thick, premium 18-gauge stainless steel for exceptional durability and universal style. This Undertone sink offers a gracefully curved shape and an extra-spacious single bowl for convenient washing and rinsing of items. A mirror-finish edge adds an elegant accent. Constructed from premium stainless steel, the sink features an engineered sound-absorption system significantly that reduces disposal and dishwashing noise. Bring understated style and professional polish to your kitchen with this contemporary Undertone sink. Constructed from durable stainless steel, the squared basin features engineered sound-absorption technology that significantly reduces disposal and dishwashing noise. A mirror-finish edge adds an elegant accent. ALL-IN-ONE 20G Top Mount Double Kitchen Sink - 20.6inch x 31.3inch x 8 inch deep The Glacier Bay Top Mount Stainless Steel ALL-IN-ONE 20.6inch x 31.3inch x 8 inch deep double Bowl Kitchen Sink is with a contemporary design. 20-gauge premium 304 series stainless steel, the multi-layer undercoating significantly reduces noise when the sink is in use and prevents condensation. The stainless steel design complements many decor styles and the top mount installation allows for simple integration into your kitchen design. Easy to install with mounting hardware included. Limited Lifetime Warranty. ALL-IN-ONE 20G Top Mount Double Kitchen Sink - 20.6inch x 31.3inch x 8 inch deep is rated 5.0 out of 5 by 1. Rated 5 out of 5 by Evie from Incredible value This sink was bought to replace the one I had. I decided on this one because its dimensions fit the space in my counter. The box contained everything needed for the installation and my installer was very impressed!! The quality of this item is second to none, much sturdier than I was expecting for the price and the sprayer is a welcome addition to the unit.